Thousands of members of civil society organisations and the public in Port Vila and rural communities around Efate, are expected to take part in a peaceful march from Fatumaru Bay to the Melanesian Spearhead Group Secretariat at Independence Park, to demand the MSG Leaders to give full membership of the Melanesian Sub Regional Organisation to the people of West Papua next Friday on April 29. Chairman of the Vanuatu West Papua Association in Port Vila, Pastor Allan Nafuki makes the announcement ahead of the planned peaceful march from Fatumaru Bay to the MSG Secretariat. He is appealing to all responsible people to take part in the peaceful march. The outspoken Chairman is confident his committee’s application will be approved by the police to allow the planned march to take place. 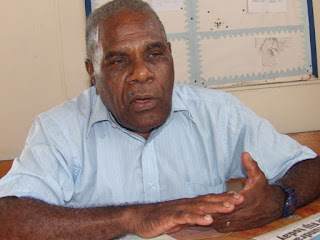 “We are organising the Civil Society Organisation Parallel Forum four days prior to the MSG Leaders’ Summit on May 3, which will be hosted by the Vanuatu Government,” the Chairman says. The Chairman and members of his committee have been lobbying the people in a series of public places in the Capital including market houses, to collect signatures from members of the public who support West Papua to become a full member of MSG. It is understood the Vanuatu Christian Council is also encouraged to allow members of individual churches to also sign the petition at the entrance to their churches. Pastor Nafuki says they have already collected 5,000 signatures and are targeting 12,000 to let Indonesia know that the people of West Papua are not alone in their bid to gain their rightful place in MSG. In preparation to the march, a Civil Society Organisation Parallel Forum will be hosted by the Vanuatu West Papua Association in Port Vila from April 29 to May 2. The West Papua Association is inviting civil society counterparts from Australia, New Zealand, Fiji, the Solomon Islands and New Caledonia to also take part in the Forum. Some of the regional participants are already in Port Vila.